How did your fiance pop the question? Justin planned a weekend trip down to Boston. We had a fantastic morning at the Museum of Fine Arts, lunch at the Top of the Hub in Prudential tower and visited the New England Aquarium. While walking across Christopher Columbus park, Justin stated that his knee was hurting. We stopped at the fountain next to The Rose Kennedy Rose Garden to tend to it. He got down on one knee and proposed to me, asking if I would be his wife. After I said yes, I heard clapping behind me, assuming that it was people in the park. He instructed me to turn around. To my surprise, there were about 20 of our friends and family crossing the street and cheering for us as they had just seen and heard him propose. We all had the pleasure of eating dinner and mingling at Fogo de Chao, a Brazilian steakhouse. He did a wonderful job keeping everything a surprise and everyone informed as to what was going on. I was later let into the Facebook event that was created just to see all of the planning. It was memorable, wonderful and a very heartfelt experience. The theme of my wedding is an intergalactic/cosmos atmosphere. There will be planets, stars, moons, meteors, constellations and other heavenly bodies strewn throughout the reception hall. All colors found in space are fair game, but the primary color scheme is regency (dark purple), black and silver. The biggest challenge has been trying to make decisions on what I want to do and not worrying about what other people will think. I’m very open to opinions and ideas from others and researching typical wedding traditions. Just because it is traditional or people really want you to do something doesn’t mean that you have to. This is mine and Justin’s day; everyone else will be happy no matter what napkins, table runners or centerpieces may or may not be there. I’m most looking forward to being surrounded by friends and family while Justin and I pledge ourselves to each other for the rest of our lives. What was especially important to you about planning your wedding? What about catering, flowers, photographer, decorations, etc.? All of these things are important in their own right, but it’s more important that the people chosen to perform these tasks are right for you. It was very important to me that these people understood my thoughts, ideas and complemented my personality as well as being able to trust them to tell me when they think an idea I have may not work and not be shy to explain why. Having a small team that works well together is better than having a huge team that has awkward moments. What are you planning to do before your wedding to make sure youʼre relaxed and fully present on your special day? I plan on letting go of the reins and trusting my wedding planner to make sure things go off without a hitch. No decision-making the day before and day of, with the exception of doing the rehearsal. Attempting to get extra sleep will also happen, but we’ll see how that one goes. Who helped you in the planning process? A wedding planner? Parents? Friends? Fiance? All of the above. Without people to help, I may have gone the way of Bridezilla. I told them at the beginning of the process to let me know if I ever got that way and to snap me out of it if so. The sheer amount of stuff that has to be planned out, bought, made, decorated, etc. was a surprise to me. I do not keep up with wedding trends at all, so this was a cannonball into the pool of wedding stuff for me. There were a lot of “people really do that! ?” moments. My budget fluctuated a little bit with the financial nature of our personal life, but we didn’t spend anything that we felt was unnecessary or frivolous. We both had a number that we didn’t want to exceed and we didn’t, so I’ll count that as a win. 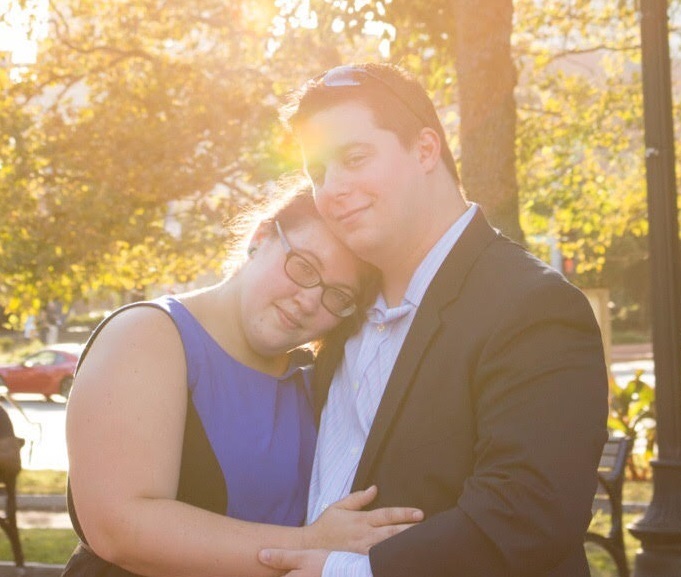 We looked online for a lot of local places that host weddings. A lot of them couldn’t accommodate the numbers that we are expecting to show up. The Agora Grand was the only place that we went to in person. I walked in and was hooked by the atmosphere of the Inn at the Agora alone. Both Justin and I love the look of cathedrals. What better place than a decommissioned Catholic Church to provide us with this amazing opportunity? We were also quite impressed with Andrew (the owner) and how he talked about the place as well. 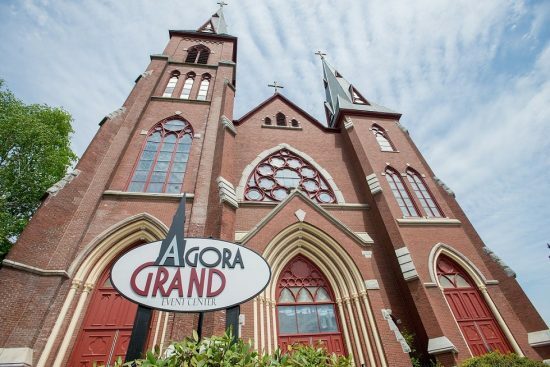 It’s exciting to get to be a part of the history of the Agora Grand. The honeymoon was given to Justin to plan. I do the majority of the wedding planning, he takes over for the honeymoon. This was decided even before he popped the question. What one tip would you offer brides-to-be about planning their wedding? Delegate, delegate, DELEGATE! Have a vision, be open to ideas and be prepared to make final decisions. You don’t have to do everything yourself, so don’t be afraid to give tasks to people you trust and offer to help out. They will let you know if something goes wrong or figure out how to fix it.